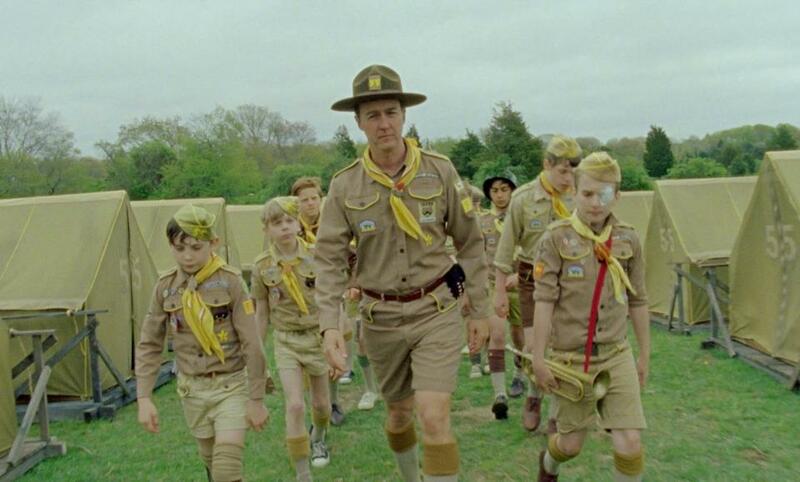 I'm going to be completely honest and tell you that this is the first Wes Anderson movie that I have watched in its entirety. The one other movie of his that I have watched is "The Fantastic Mr. Fox" which I enjoyed so much that I fell asleep three times and had no interest in going back to watch the parts I missed. 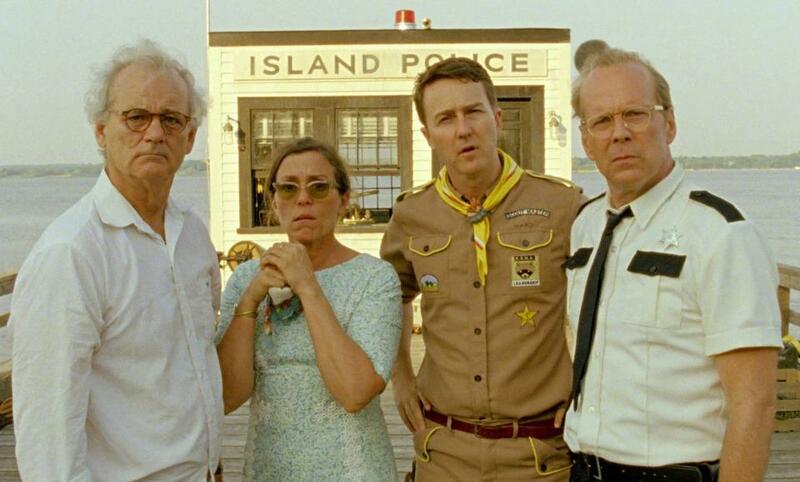 Wes Anderson fans, you can stop looking shocked and insulted as here is my review of "Moonrise Kingdom". 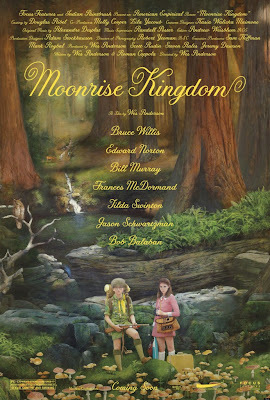 The movie stars Jared Gilman and Kara Hayward, two young actors who are both making their debut in this film by playing the main characters of Sam and Suzy respectively. Sam is a member of the Khaki Scouts although is a bit of a misfit and seems to have trouble making friends. Suzy is also a loner but her social circle basically consists of her dysfunctional family members. 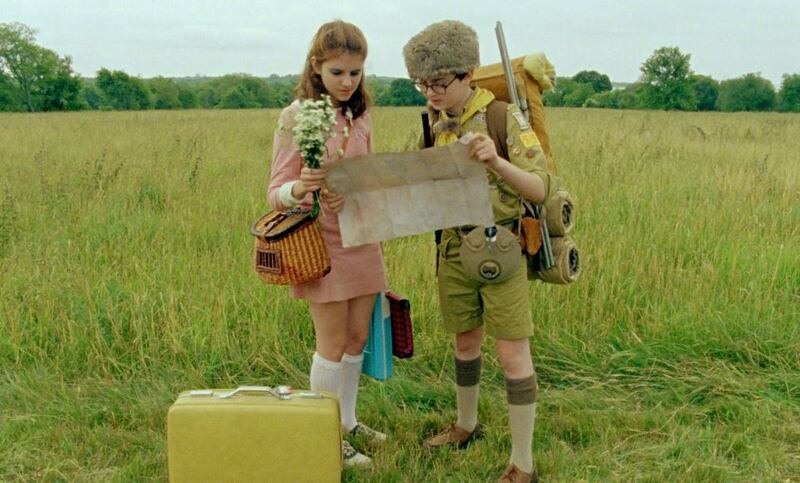 After meeting each other behind the scenes of a school play that Suzy was performing in and Sam had no interest in watching, the two become pen pals and begin planning to escape the confines of their own defective realities. The two are dreamers are in search of new worlds they can explore together and take on this task while both Suzy's family and the local authorities begin hunting them down. The beauty of this movie is the overall acting talent that is on display. 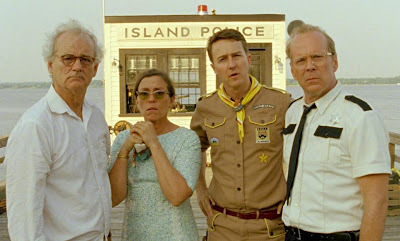 From Bill Murray and Frances McDormand who play Suzy's parents to Edward Norton and Bruce Willis who play Sam's khaki scout leader and a local police officer. Its fun to watch them play around in Anderson's quirky sandbox and really take advantage of such a well written script. Gilman and Hayward are also a joy to watch on screen and I doubt if a better job of casting could ever have been done with these two. You really believe these two kids are truly in love and on their way to joyfully experience whatever the world puts in their path as long as they are together. 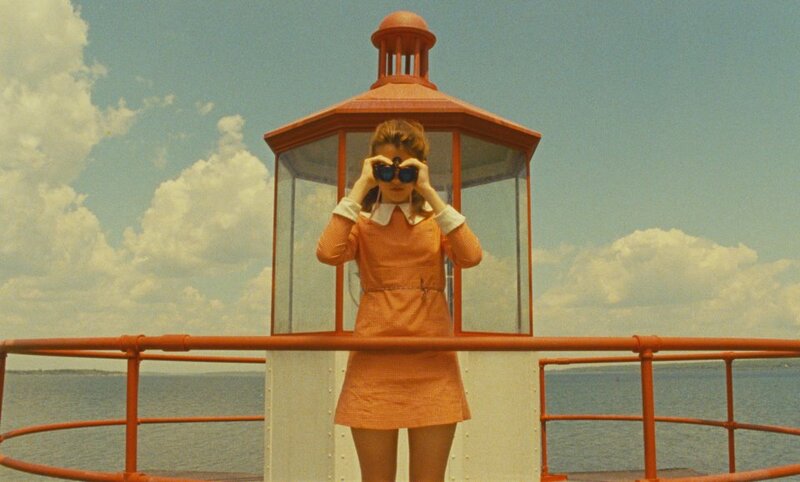 I don't know of very many directors that could get so much out of actors that are in their early teens. My only gripe about this movie is that the story, while unique and fun, never really grabbed me or got me to fully invest myself in to it. Yeah, it was great seeing all these people on the screen, but at the same time, that's all I felt I was doing was enjoying the actors do their thing and not losing myself in the world they were trying to draw me in to. Yeah, Wes Anderson fans, maybe I just don't "get it" and maybe I should watch more of his movies, but honestly I shouldn't really have to. 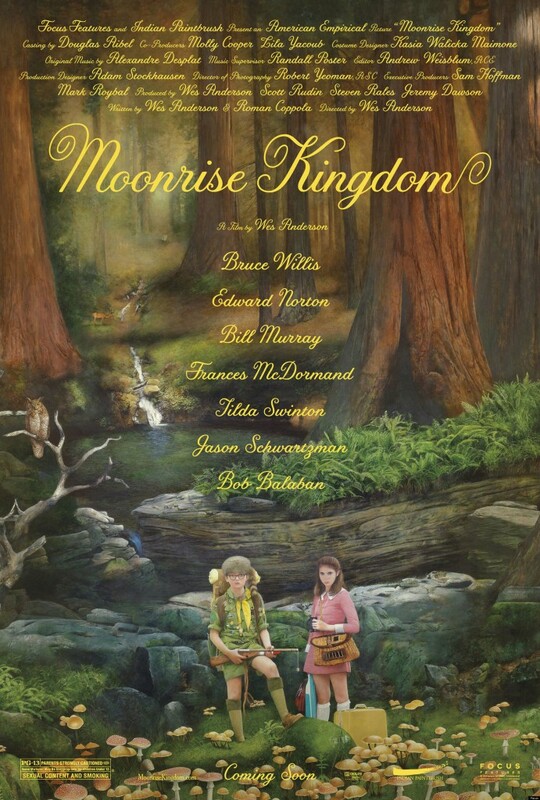 Don't get me wrong, I did enjoy "Moonrise Kingdom", I just didn't find it to be nearly as good as I was hoping it might be. You lost me at The Fantastic Mister Fox. That movie was horrible and George Clooney has yet to apologize for his part.